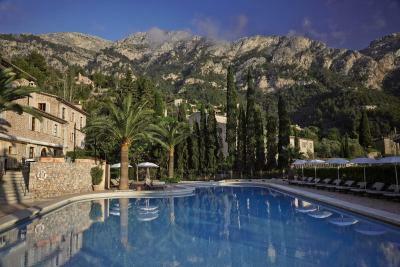 Lock in a great price for Belmond La Residencia – rated 9.3 by recent guests! The Smile Club was fantastic. Sophie and Marta were great with the kids that really made the holiday. Hotel is magnificent, positioned high in the hills of the west coast of Mallorca. 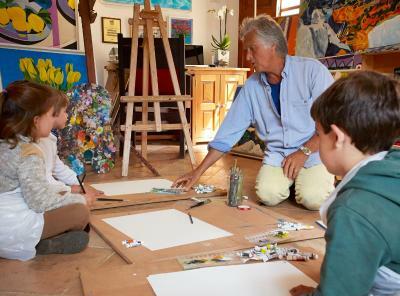 The art collection is extensive and fabulous, with paintings, prints and sculpture beautifully positioned throughout the terraced and serpentine walls and gardens. Most striking was the high quality staff who made us all feel so comfortable and well provisioned without being stuffy. 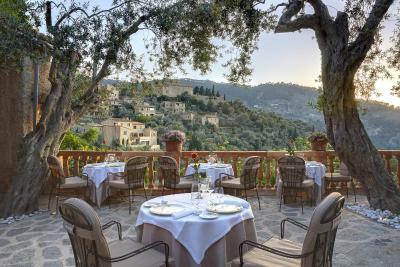 The hotel is set within the beautiful town of Deia, which was breathtaking. The staff was some of the best I have had, and they did everything just right. The location and hotel are stunning. Staff are also excellent. fantastic service and facilities. The staff could not do enough for us. The setting of this hotel is amazing. The grounds were gorgeous and large. The views overlooking Deia were stunning. The grand old original house was beautiful along with the way it was lit up at night along with all of the property made for such a serene setting. The included breakfast was good. 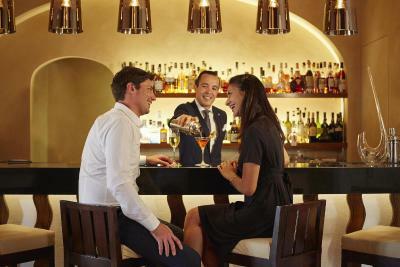 The staff throughout the hotel were lovely and always eager to help out. Beautiful hotel in a stunning setting; elegant, but relaxed. 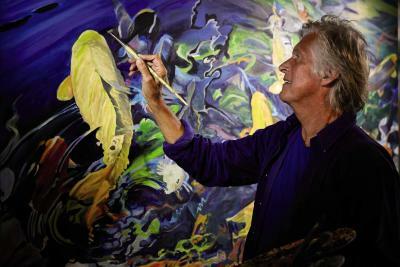 The staff were absolutely fantastic, always polite, friendly, charming and professional. Just love this place, a real gem. Whole process from being met at arrival to being helped at departure was a masterclass in redefining customer care...beyond 5 star. 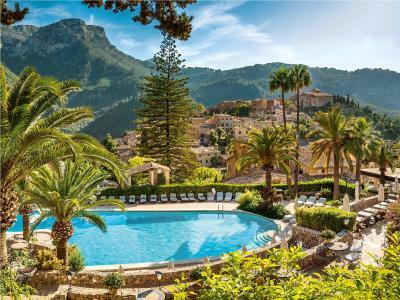 Belmond La Residencia This rating is a reflection of how the property compares to the industry standard when it comes to price, facilities and services available. It's based on a self-evaluation by the property. Use this rating to help choose your stay! 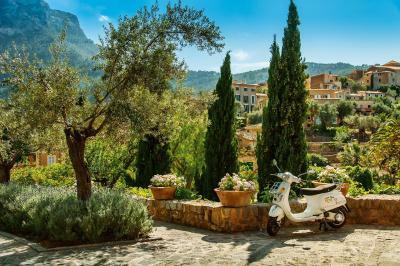 Belmond La Residencia is located in the charming artist village of Deià, Mallorca. 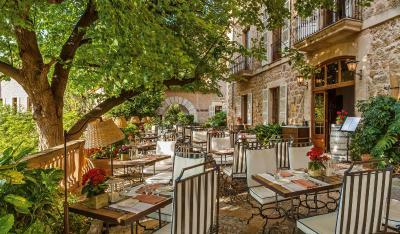 With its building dating back to the 16th century, the hotel features 2 outdoor pools, an award-winning restaurant and a spa. Offering sea and mountain views, the hotel has a hot tub and 2 tennis courts, and a tennis coach is available. There is also a sauna and a wellness center. Complimentary boat excursions are offered during the summer. 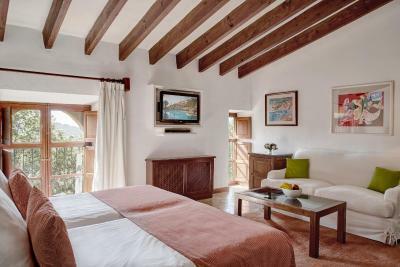 All rooms at the hotel are unique and feature traditional Mallorcan decor and antique furnishings. WiFi is free in all areas. There are fresh flowers and fruit in rooms every day. 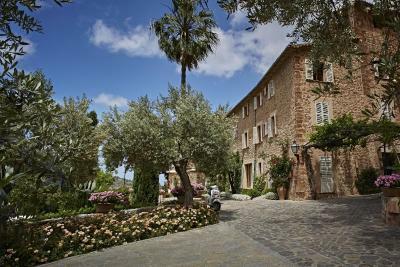 Belmond La Residencia features a permanent art exhibition and a sculpture garden. There are also classical music concerts and the hotel has a Steinway Piano. 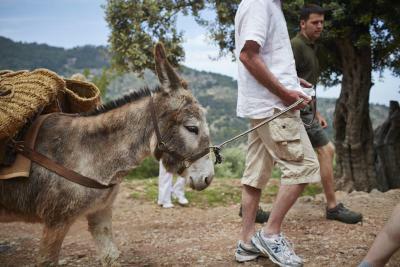 Fun donkey trails can be organized with the hotel´s resident donkeys in the olive groves. Staff can organize a private airport transfer. El Olivo is an award-winning à la carte restaurant. Café Miró is casual and offers tapas and local cuisine. There is also a pool restaurant and a snack bar. Free private parking is available. 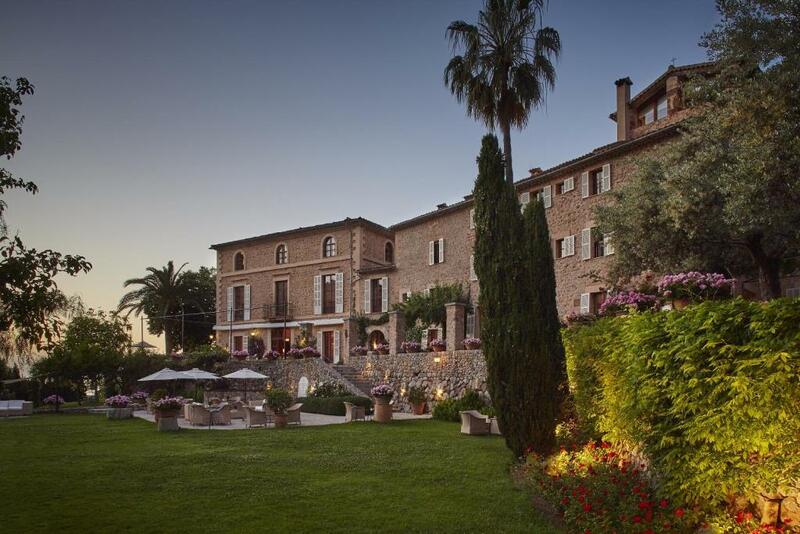 When would you like to stay at Belmond La Residencia? 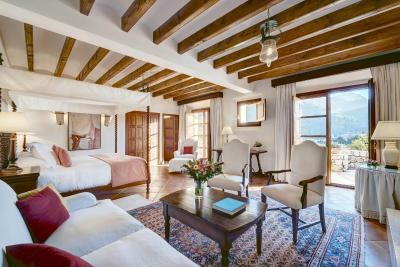 This comfortable and elegant room is more spacious and features Majorcan-style furniture, garden views and in most cases, 1 four-post bed. 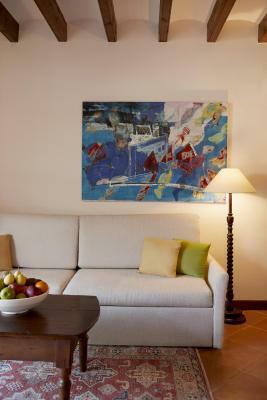 It has a lounge area with sofa and comes with free Wi-Fi, a safe, plasma TV with DVD player, iPod dock and mini-bar. A buffet breakfast is included in this room rate. 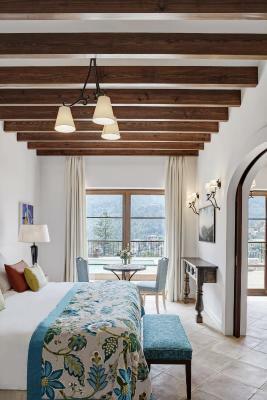 This comfortable and elegant room features Majorcan-style furniture, mountain views and 1 queen-size bed. It comes with free Wi-Fi, a safe, plasma TV with DVD player, iPod dock and mini-bar. A buffet breakfast is included in this room rate. 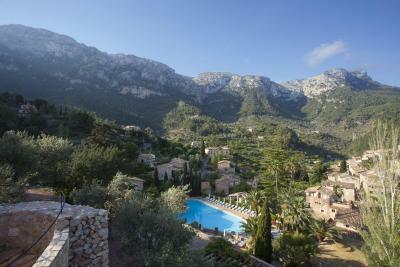 La Residencia is located in Deià, a charming peaceful village far away from the crowds. 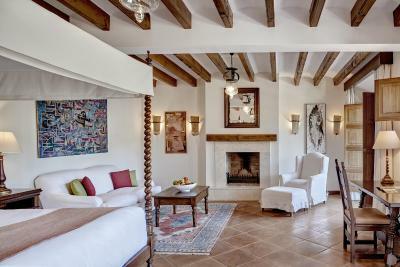 Surrounded by the majestic Tramuntana mountains, with a romantic landscape of olive, orange and lemon groves, it is home to a number of artists and poets. 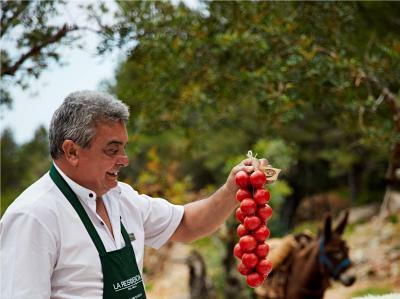 La Residencia boast the famous restaurant El Olivo which has been classified as one of the best restaurants in Spain 2010 by Restauradores and won the Wine Spectator Award of Excellence for the 12th year running in 2012. 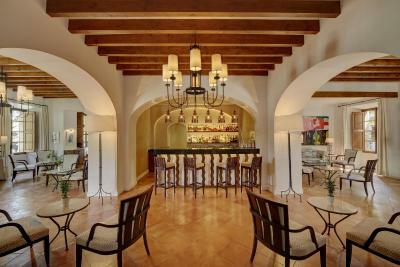 La Residencia have in total 2 more restaurant, Son Moragues restaurant and the Pool restaurant. Our award-winning Spa has an indoor pool, Jacuzzi, sauna, steam room, gym and six treatment rooms. Three of these benefit from open-air terraces, allowing guests to enjoy a soothing treatment while admiring the spectacular view. 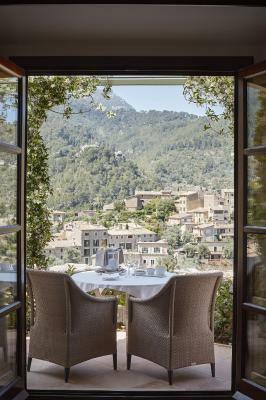 House Rules Belmond La Residencia takes special requests – add in the next step! 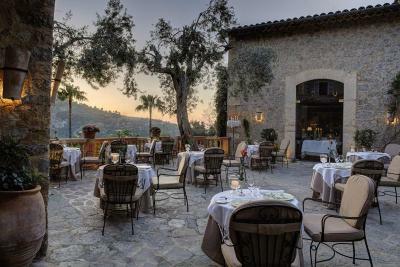 Belmond La Residencia accepts these cards and reserves the right to temporarily hold an amount prior to arrival. Please note, when booking more than 4 rooms, different policies and additional charges might apply. The rooms are seriously dated in terms of the design and fixtures/fittings At this price for a room and for 2019 they need a major update. 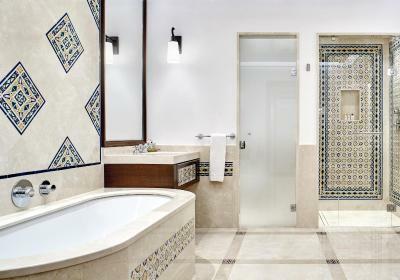 Things have moved forward in terms of quality of hotel design and this is far from where it should be. It obvuiusoly shouldn't be trendy but needs a refresh...furniture, art, etc... The cleaning crew just leave massive industrial bags of towels in hallways to step around, turndown service is always such a luxury but they come to do it at 7pm when they use realise you're just back to your room after a day out trying to rest so you just send them away. 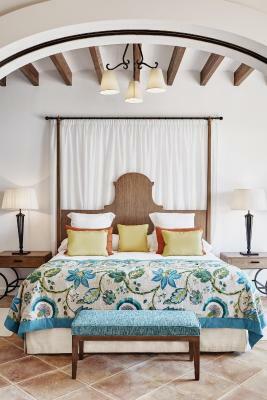 How nice would it be to come back after dinner to a room turned down? We never found out. The prices in the Miro Bar are absolutely ridiculous and extortionate. A good 30%-40% higher than they realistically should be. If you are outside on the patio on a wonderfully sunny day you might forget that for a bit...but when it's cloudy and cool and you're inside a bar that also needs a major design update in terms of furniture and ambiance it's ridiculous. Moat hotel bars are buzzy and I always spend too much time there. Not so this one as I think you can read in most reviews about the obscene pricing so always quiet and it's never too exciting to be there. We wound up buying a bottle of wine at a shop just at the entrance to the hotel for a third of the price of a glass in the bar and had it in the room. There’s nothing bad to say. 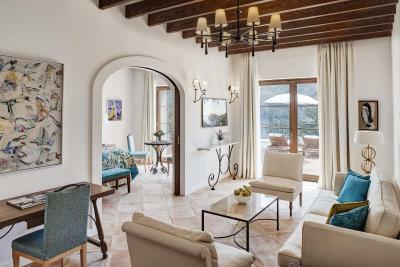 Excellent stay again at La Residencia. Perfect place to unwind. The staff were immensely welcoming throughout our entire stay, and in addition incredibly efficient. Our room was amazing, as was the food and the hotel location. Couldn’t have wished for anything better. Not a thing........but if you don't like stairs, this property will be a challenge. There are elevators but the best walks, views, and destinations are at the top of many outdoor staircases. Staff were very good and the location was beautiful and restful! Towels could have been a little fluffier! Everything! The staff !the location !the ambience! The bed! the food! The gin and tonics on the terrace! The jacuzzi The pool! The Spa! The location,excellent staff and ambience.